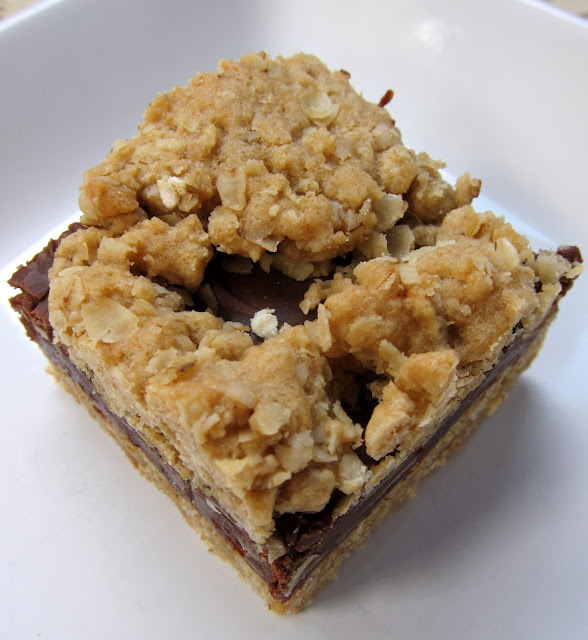 Oatmeal Fudge Bars - oatmeal almond cookie bars with a yummy fudge layer in the middle. Oatmeal, flour, baking soda, salt, butter, brown sugar, eggs, vanilla, sweetened condensed milk, chocolate chips and almonds. Great make ahead dessert. Perfect potluck dessert. I made these Oatmeal Fudge Bars a few weeks ago and they were a huge! They are basically an oatmeal cookie with a fudge filling. They are easy to throw together with ingredients that you probably already have on hand. I used sliced almonds in the fudge layer, but any nut would work. Next time I might try toasted pecans. 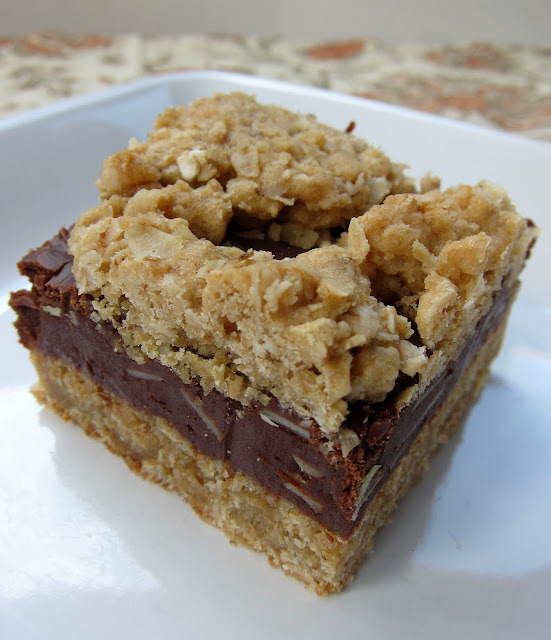 I suggest making the bars the day before you want to serve them so the fudge layer can set up. We sampled one after it had cooled for a few hours and it was really good, but it was outstanding the next day! It is amazing that something so simple can taste so good! They also travel well, so they are perfect for a tailgate party! Preheat oven to 350ºF. Lightly grease a 9x13 inch baking pan. In a large bowl, beat together 1 cup butter and brown sugar until fluffy. Mix in eggs and 1 tablespoon vanilla. In another bowl, combine oats, flour, baking soda, and 1 teaspoon salt; stir into butter mixture. Set aside. In a medium saucepan, heat sweetened condensed milk, chocolate chips, 3 tablespoons butter, and 1/2 teaspoon salt over low heat, stirring until smooth. Remove from heat. Stir in almonds and 1 tablespoon vanilla. Pat 2/3 of the oat mixture into the bottom of the prepared pan. Spread chocolate mixture evenly over the top, and dot with remaining oat mixture. Bake for 30 to 35 minutes in preheated oven. (Do not over bake) Let cool on a wire rack, then cut into bars. Now, see... THIS is what people should bring to a tailgate... none of those plastic box stale chocolate chip cookies ;-) Yum! You are on a roll!!! With the Coke Cake yesterday and this today, we're going to gain 10 pounds by Monday! LOL!! Thanks for the great post! Must have these VERY soon. I'll have to hide them in my house to have any left for the next day. I am afraid to make these - I think I would eat them all myself. They look delicious. I've seen these before but have never made them...need too NOW! Wow! What an awesome recipe! I found it over on Pinterest and tested the recipe out for my weekly Pinterest Test Kitchen post. They got a 5 star rating!! !